ASP.NET Web Forms charts (graphs) library has support for 30+ chart types such as line chart, bar chart, pie chart, area chart, stock charts, etc. Its rich feature set includes zooming, panning, tooltip, crosshair, trackball and drill-down functionality. The ASP.NET Web Forms Charts, a well-crafted easy-to-use charting package, is used to add beautiful charts in web and mobile applications. It contains a rich gallery of 30+ charts and graphs, ranging from line to financial charts, that cater to all charting scenarios. Its high performing quality helps to render a large amount of data quickly in your user’s browser. 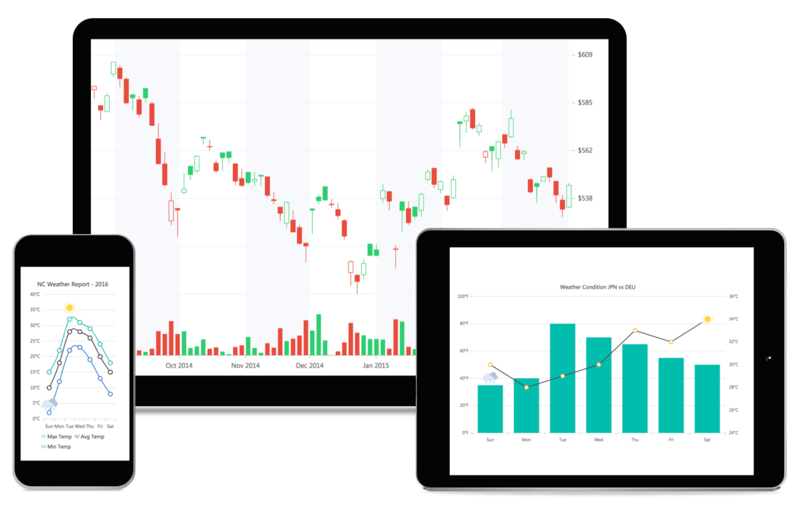 It also comes with a lot of features such as zooming, panning, tooltip, crosshair, trackball, drill-down, and events to make the charts more interactive. Legends allows users to display additional information about the chart series and it can be placed at the left, right, top, or bottom of the chart area or they can be docked anywhere within the chart area. Allows you customize the appearance of any part of chart using built-in API’s. And comes with several built-in themes.